Silent Sunday: 26 February 2012 | Phil – Refuelled! Trying to understand why you painted the tree blue – is it some sort of protection against …I don’t know what? Or are you just being artisitc? Looks very striking though. Ha! The ‘white balance’ did that! The painting was with an LED torch. I shall try out other light sources and WB settings. That’s a funky lighting effect. You should find a baobab tree to try that one out on, that would look seriously creepy! There isn’t one very handy here – but I do intend to experiment further! 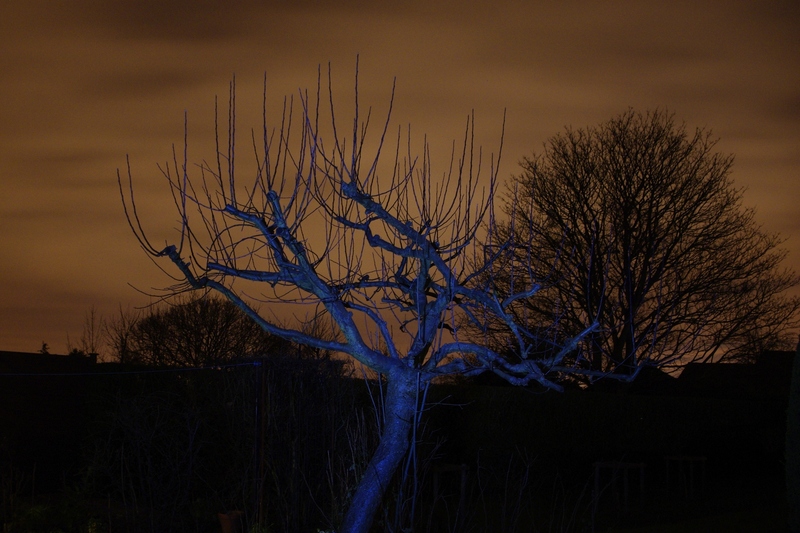 The sky colour is from the loom of city street-lighting – made more evident by the long exposure time! Great picture, i like the way the tree is lit! -and is this effect of one two many ‘firefly gin cocktail’ ?! Like that effect. Very spooky. what a stunning photo looks all mystical! Cooool effect! It’s definitely spooky. Wow that is so cool. Please teach me? This is a super cool tree – lovely effect. Very arty, I want to know how to do this sort of thing! Is it just practise and playing around? ooooh really interesting image, you do come up with some fascinating shots!